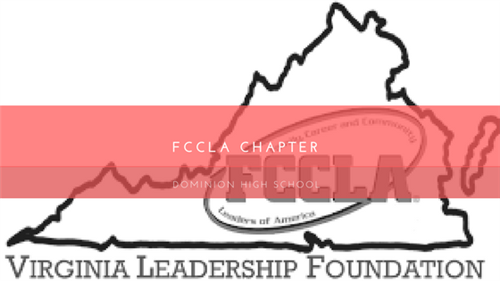 Dominion High School's FCCLA chapter is sponsored by Mrs. Kittelson and Mrs. Wortman and will be integrated into the Family and Consumer Sciences classes. As FCCLA's mission states students will be given opportunities for leadership and personal growth through participation in their chapter. Our FCCLA chapter is young but our students are making a difference. Our chapter has worked on the individual, group, and National Leadership projects and presented them at both the State and National Leadership Conferences. This coming school year students will compete at the State Leadership Conference in April in various events representing all FACS courses. In order for students to participate, they will need to pay their $25 dues which we will collect at our first meeting. FCCLA is a career and technical student organization that functions as an integral part of the Family and Consumer Sciences education curriculum and operates within the school system, and it provides opportunities for active student participation at local, state, and national levels.